Charles Schulz said that happiness is a warm puppy. Christopher Hart agrees and has come up with ninety-nine more cartoons to make you happy! From the most memorable moments in ones's life (bringing home a new baby, getting that promotion, hitting it off on a first date) to adorable pets and unlikely animal buddies and from trips of a lifetime to everyday pleasures (sharing secrets with a friend, reading a good book, buying a new pair of shoes), everything that makes life worth living is fodder for fun-filled drawings in Draw 100 Things to Make You Happy. Step-by- step drawings with tips and techniques provide endless characters, scenes, and situations to expand artistsâ€™ drawing repertoire. Enlightening sidebars sprinkled throughout cover all the things that make drawings come alive: how to tie things together visually, using color, changing poses, personalizing the drawings, adding shading, and more. 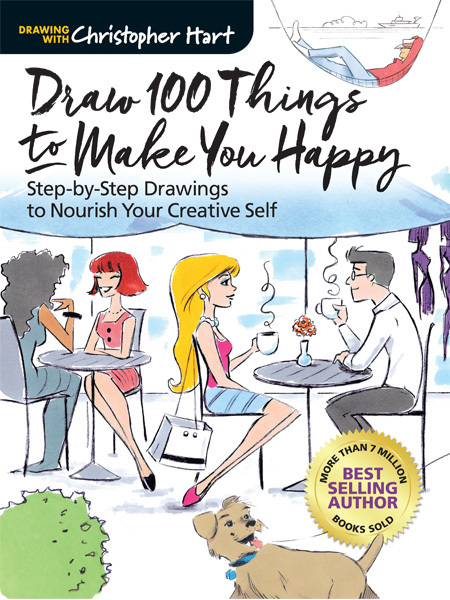 Draw 100 Things to Make You Happy is the cartoonist's ultimate bucket list.